The International Academy for Interfaith Studies has hosted an Interfaith Harmony Breakfast for three years in San Miguel del Allende, Mexico, and is now going to host the first Interfaith Harmony Breakfast in 2017 in Honolulu, Hawaii. 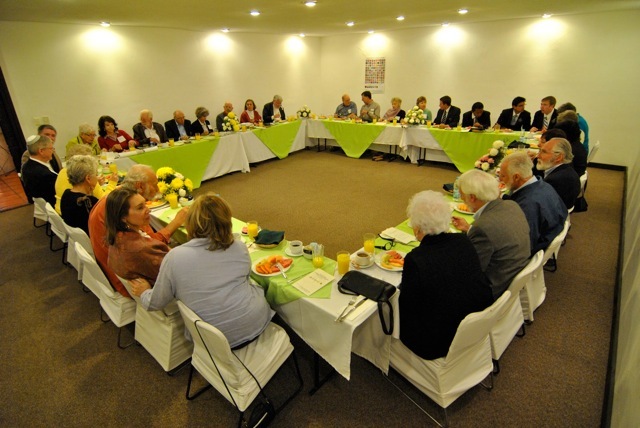 These annual breakfast meeting are to encourage greater harmony among the leaders of religious within a community. For example, most of the San Miguel’s spiritual leaders to attended the celebration of World Interfaith Harmony Week for three years proclaimed by the United Nations’ call for “A Common World”. 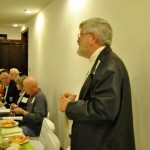 The Reverend Doctor Thomas Lynch, founder of the Interfaith Academy in San Miguel and Honolulu, founded the events. In Mexico, Irma Rosado represented the Mayor’s office and spoke with pride that San Miguel was the only city in Mexico participating in this important international event. She felt the event was consistent with San Miguel’s unique position as a beacon of international cooperation and fellowship in the world. Each of the religious leaders contributed to the spirit of interfaith harmony with a few words, prayer or song. I was born to give. I perceive so much that I forget I have much to give from what is inside of me. I can give love to my family and to others. I can give support to my friends. I can give inspiration to all. I can give delicacies every day. I can give the best of my work. I can give attention to those who will accept it. I can give consolation to the sad one. I can give advice to the needy. I can love in each detail. I can give my life in this way. I can be a companion on the path to those who I meet and with God. Unto others I can love and be loved. The Reverend Bill King of Friends of Unity shared, In oneness with God, I completely and totally accept the gift of my being and I live wisely, lovingly, confident, and joyously, Christ in me, the HOPE of glory. Dr. Dan Lessner and Carole Stone, Co-Presidents of Shalom SMA represented Judaism and graced the meeting with a traditional Hebrew song of brotherhood. Many in attendance, including all the young Mormon elders, knew the Hebrew and joined in. Be an ornament to the countenance of truth, a crown to the brow of fidelity, a pillar of the temple of righteousness, a breath of life to the body of mankind, an ensign of the hosts of justice, a luminary above the horizon of virtue, a dew to the soil of the human heart, an ark on the ocean of knowledge, a sun in the heaven of bounty, a gem on the diadem of wisdom, a shining light in the firmament of thy generation, a fruit upon the tree of humility. Lord, make me an instrument of your peace, Where there is hatred, let me sow love; where there is injury, pardon; where there is doubt, faith; where there is despair, hope; where there is darkness, light; where there is sadness, joy. As we come together this morning, many faiths, cultures, races and nationalities, let us know that we are all One. As we embrace acceptance and unity in diversity we can truly make a difference in healing this world of a feeling of separateness and being alone. Let this living, loving Presence of God in our life bring light, energy and power to us all and know the Oneness that is the Truth. May we become aware of and let go of all things which stand in the way of peace for us and our communities. May we realize the peace at the core of us all, within ourselves and our congregations. May we realize the peace among our varied traditions. we humbly bow to you all. to the blessing of Thy Light, Thy Love, and Thy Joy. and may we be able to awaken Thy Love in all hearts. I know that there is One Creative Power, Presence and Substance. It is expressed in and as and through all creation, including me. As part of this Omnipresent Reality and Unity I recognize, respect and love all people of all races, cultures, nationalities, ethic groups and religions. I know that each person has the wisdom to live his or her life at the very highest level of understanding, with great love for all. As this is happening people discover ways to cooperate together to create prosperous, healthy and fulfilling lives. This Spiritual Mind Treatment acts as a Law of Elimination to all untrue beliefs in separation and their resulting effects. A new consciousness of true unity is awakening in people all over the world. This gathering happening today in San Miguel de Allende is part of the awakening. I am grateful this is so. And so it is! Elders Backman, Buxton, Garcia and Ruiz represented the Church of Jesus Christ of the Latter Day Saints, the Mormon Church. 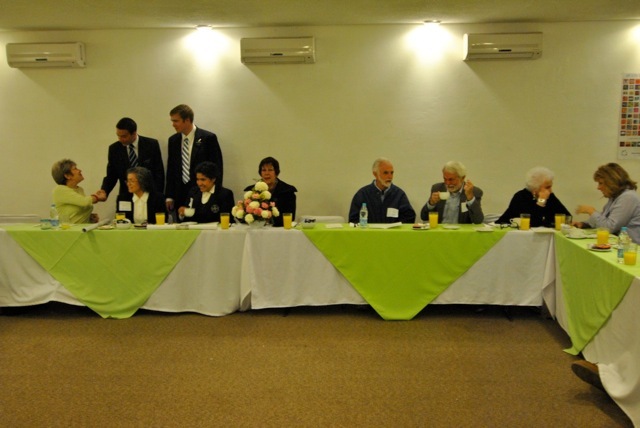 Elder Buxton joked about the young age of his “elders”, spoke in generous terms about the concept of interfaith harmony. The Quaker faith, represented by Peggy Purcell of SMA together with her guests John and Janet Thompson, members of London Grove Friends Meeting, Pennsylvania, holds that there is “that of God in every person.”, therefore all are called to the ministry, and to refrain from being combatants during wartime. 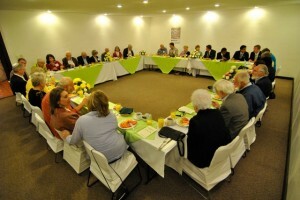 In the Quaker tradition, the Harmony Breakfast ended in a moment of silent worship and reflection. “I very much believe in what the group is about. 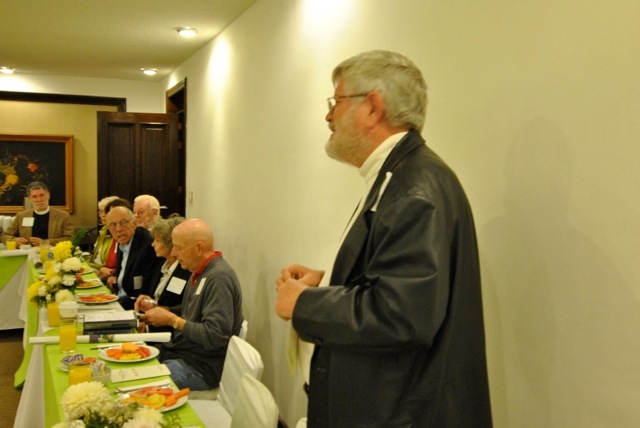 I have felt for many years that if the people of faith worldwide unite the positive energy would be immeasurable!” said Phil Roger at the closing of the meeting. His wife, The Reverend Doctor Cynthia Lynch, co-founder of the Academy, was also pleased with the outcome of the breakfast. 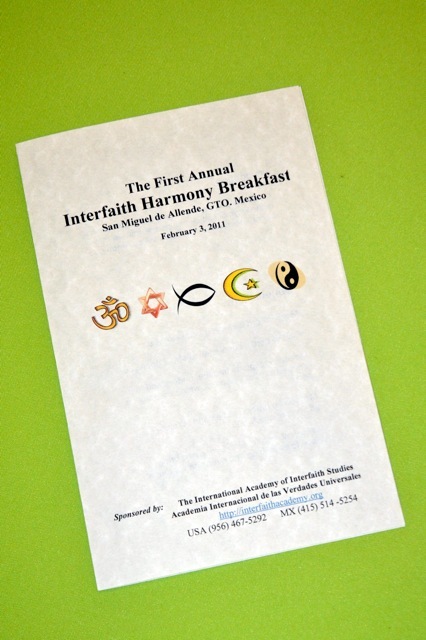 “We hope that this will become an annual event and will expand to include all in the community, perhaps by common meals in neighborhoods or as a day when households in the community join the celebration by hosting breakfasts in their own homes for people of different faiths and beliefs,” she said.